The Nuremberg trials were a series of twelve trials held between 1945 and 1949 involving over 100 defendants who were important officials in Adolph Hitler’s Nazi Germany. The trials were held in Nuremberg, Germany and were conducted by a judicial tribunal composed of judges from the Allied Powers, which included Great Britain, France, the Soviet Union and the United States. 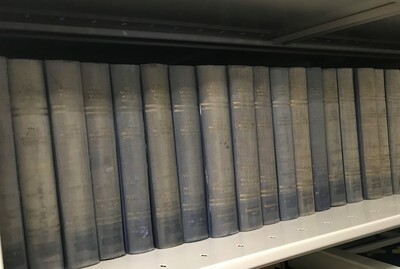 The Lynn University Archives has a complete 42-volume set of “The Blue Series,” which is the official record of the trial of the major civilian and military leaders of Nazi Germany who were accused of war crimes before the International Military Tribunal at Nuremberg, held November 20, 1945 - October 1, 1946. Published in 1947, Lynn’s copy of the series was previously owned by U.S. Supreme Court Justice Robert H. Jackson, who was also the Chief Prosecutor at the Nuremberg Trials. See this iPulse article for the full story. The London Agreement of 8 August 1945 established the tribunal, which was composed of one member and an alternate from each of the four Allied countries: the French Republic, the Union of Soviet Socialist Republics, the United Kingdom of Great Britain and Northern Ireland, and the United States of America. English, French, German, and Russian were the languages used throughout the hearings. Documents entered into evidence were reproduced in this series only in the original language, but as the result of the absence of a Soviet editorial staff, none of the Russian-language documents were published.